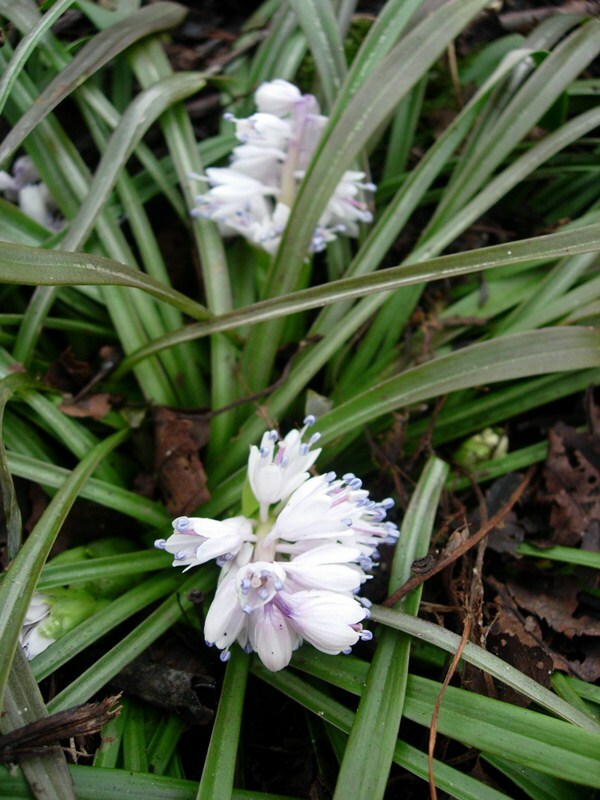 Wim, I've been admiring photos of this unusual genus over on SRGC, seems to be a popular genus in Europe, I have never met seen this plant in North American gardeners, although I don't "get out that much". This is a genus I must look into, as I like small (and early blooming) Liliaceae for the woodland; thanks for showing this one. Did you grow yours from seed, if so, how long to get a plant to flower? What are the plant's moisture requirements, wondering how it would do in my dry woodland conditions. 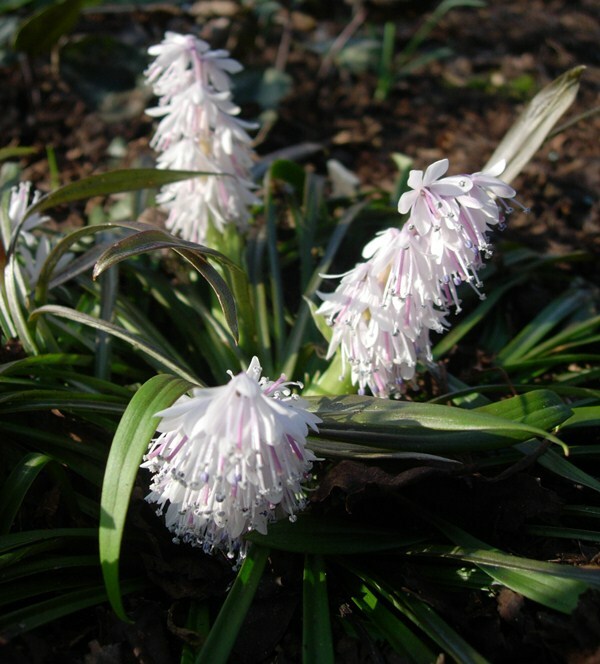 The name Ypsilandra is unusual, and sort of fun to say. Not very familiar with the genus I looked it up in Flora of China, and I learned a lot about it, the related genera Heloniopsis and our own Eastern US Swamp Pink" Helonias bullata. I share a miscellany of pertinent links. Tanaka (J. Jap. Bot. 73: 102--115. 1998) reduced Heloniopsis and Ypsilandra to synonymy under Helonias. However, a recent molecular phylogenetic study by Fuse and Tamura (Plant Biol. 2: 1--13. 2000) confirmed that Helonias Heloniopsis and Ypsilandra are not mixed with each other, and they each deserve independent generic status. More discussion on the Helonias, Heloniopsis and Ypsilandra on the Flora of North America site, where the single N.American plant Helonias bullata is covered. Photo taken in Marsha Russell's garden, Littleton, Massachusetts. Here's another picture of Ypsilandra cavaleriei from today. I've only ever seen Y. cavaleriei and Y. thibetica either. I didn't even know there were three other species. I'll post some pics of Heloniopsis when they are flowering here. As for Helonias: that is a really stunning plant. I've tried it from seed a few times but was never successful. I guess I'll have to buy a plant. I am planning to make a new garden in a singular low spot (still up on a hill) in my garden, when I envision the ability to grow plants needing more moisture. In spring, I can't mow the grass in this small area until about June because water run-off from the hill passes through and my tractor mower gets stuck in the mud. Regarding Helonias, this is a true swamp plant, has to be grown with its feet in water, at least that is how I've seen it growing here. North of me, in Southern New Hampshire, Dr. George Newman has a fantastic woodland garden of 4-5 acres, surrounded by wetlands and swamps. He puts "waders" on and plants the swampy areas with Helonias, where they grow to majestic proportions, taller than you might imagine... most impressive. My friend Marsha Russell, grew her plants in large tubs outdoors, the tubs sitting in a 6" deep pool of water in almost full sun; her plants did not grow as tall, but always flowered splendidly. With a low spot which stays damp you might be able to grow these plants. I look forward to seeing your project progress. I've tried sowing Helonias in swamp-like conditions. In the same way I sow Sarracenia, Pinguicula and Drosera. But maybe they need another growing medium than a peat/sand mix? I have been looking for other species of Ypsilandra to grow here. I have had Y thibethica for years and it grows very well in a rather dry position in my woodland. It blooms early but not yet this year. I have never seen seed but I think youhave to grow different clones. Seems that cavaleriei looks abit better but my plant grows in deep shade. Rogaland, Norway - with cool, often rainy summers (29C max) and mild, often rainy winters (180 cm/year)!